This book delivers completely new and refreshing ideas on how to create value in the world. From it I learned that the best way to grow a business is by dominating a small niche and grow from there with an ambitious long-term vision. Zero to One really helped me understand that in order to do unique or extraordinary things, you have to think in a very unique way. By thinking like the rest of the world, it’s easy to follow what everyone else does or says and lose the ability to think individually and objectively. In Peter Thiel's book, he asks the question "What important truth do very few people agree with you on?" If you can answer that question it will give you the direction on how & where to grow your life & business to the next level. I would say the one book for entrepreneurs, there's several books that I recently read. Peter Thiel has a book. Zero to One I read. It was good. There’s a lot of business books out there. 99% of them are BS. Read this one. I love his story on my podcast what exactly happened in the room when a 24 year old Mark Zuckerberg was offered $250,000,000 and refused it in two minutes. Enjoying brilliant, often provocative, Peter Thiel book, Zero to One. Will buy many and distribute to all senior execs. [Currently reading] Peter Thiel's: Zero To One. Looking for some insight on how he sees things. Interesting to get his take on the fact that a VC is likely to need any one investment be able to return the size of that VC's fund. I have lots of books to recommend, but they are not related to my career path. The only one that is remotely related is Peter Thiel’s Zero to One. For anyone interested in startups, this is a highly recommended book about what it takes to start a business. This book is by Peter Thiel, who while I completely disagree with his worldview has seen thousands of startups both grow and fail. They have some interesting takes on what it takes to make a startup successful and look towards changing the world. In his book, he talked about how competition is for losers, and that really changed my mindset. After reading this book, I am able to think strategically on how to build a company that does not need to avoid competition. I am paraphrasing here, however when he mentioned make something 10 times better than you competitors products or don't bother at all. It shifted the end result I was looking for in the business I currently run. I changed the whole approach about what the business would offer and how products would be delivered. Zero to One by Peter Thiel because the book perfectly encapsulates what makes a tech startup incredibly successful and I often find myself thinking of his thought process when looking at adding a feature or investing in a company. This book is written by Peter Thiel and I admire him a lot. I was always curious to know about his journey, he clearly presents his views on businesses and startups in this book. Thiel's philosophy of "competition is for losers" rings very true. It's a book that will make you stop and think about what kind of business you're building and what kind of impact you're having before you start. I would recommend Zero to One by Peter Thiel because it gives different perspectives on how to create value in this world. In the process of an acquisition of my business by a bigger company, I was reading Zero to One by Peter Thiel, and it helped me understand the meaning behind an acquisition, and what to expect from it. I really enjoyed this book because it is very easy and quick to read, but still has a lot of value. Still today its lessons are keys to how I chose to invest, how I see companies and how I tend to think when working on mine. There's a great book by Peter Thiel (I love the book but I don't endorse his political preference). In that book he addresses how hard it is to start a nothing and turn it into something. You start with zero and you get to one. That's the hardest thing you can do. Although it’s not my favorite book it’s a good way to understand the mentality of this industry and get into the swings of things. Zero To One is a great book. I learned a lot reading it. When a risk taker writes a book, read it. In the case of Peter Thiel, read it twice. Or, to be safe, three times. This is a classic. If you want to build a better future, you must believe in secrets. The great secret of our time is that there are still uncharted frontiers to explore and new inventions to create. 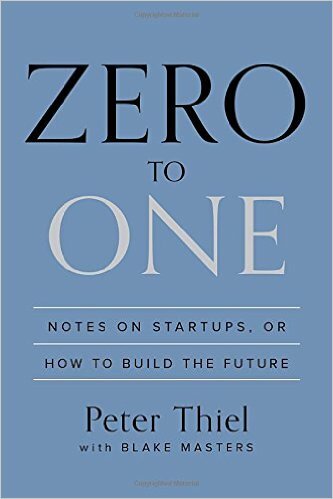 In Zero to One, legendary entrepreneur and investor Peter Thiel shows how we can find singular ways to create those new things. Thiel begins with the contrarian premise that we live in an age of technological stagnation, even if we’re too distracted by shiny mobile devices to notice. Information technology has improved rapidly, but there is no reason why progress should be limited to computers or Silicon Valley. Progress can be achieved in any industry or area of business. It comes from the most important skill that every leader must master: learning to think for yourself. Doing what someone else already knows how to do takes the world from 1 to n, adding more of something familiar. But when you do something new, you go from 0 to 1. The next Bill Gates will not build an operating system. The next Larry Page or Sergey Brin won’t make a search engine. Tomorrow’s champions will not win by competing ruthlessly in today’s marketplace. They will escape competition altogether, because their businesses will be unique. Zero to One presents at once an optimistic view of the future of progress in America and a new way of thinking about innovation: it starts by learning to ask the questions that lead you to find value in unexpected places.